The desire to excel the ability of their predecessors of the 19th century and to perfectly reproduce the old works if possible, accentuating the difficulties in working them had stimulated the Venetian glass-makers in orienting themselves towards a production inspired by the old. It was this mentality which also remained at the beginning of the new century (20th century) on the lagoon island, thereby rendering the abandonment of tradition and the elaboration of new aesthetic criteria difficult. It was the nineteenth century experience, on the other hand, which had offered the technical instruments to the Liberty glass-makers of Murano, from amongst whom were also numbered some of the protagonists of the epoch of revivals, and this determined one of the distinctive characteristics of the modern local products: they were not, in fact, born from new working processes, as happened for the most esteemed of foreign works, but from the exploitation in a modern and colouristic key of techniques which had been experimented at length. It is also to be noted that in the first twenty years of this century the glass of modern style was produced at Murano quite discontinuously, for the most part on the occasion of the Venice Biennale exhibitions and of the Fondazione Bevilacqua la Masa at Ca’ Pesaro. Only in the immediate post-war period did the factories begin a normal production of non-traditional models which often constituted the development of attempts made in previous years. Goblets with shank spiral. Exhibited to the first Biennale di Venezia in the 1895. With the 20’s and 30’s the situation changed considerably. 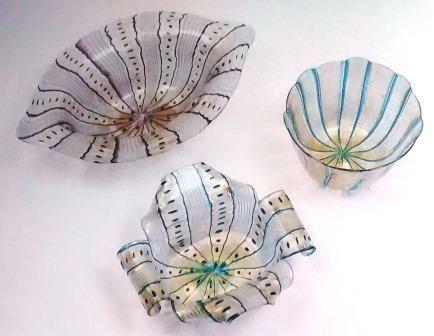 In the 1920’s Muranese glass-making positively felt the changes which had taken place in the international artistic world to a greater extent than had been the case in the pre-war period. If, in fact, the Liberty movement had caused sporadic enthusiasm upon the background of production which was still addressed to the repetition of the styles of the past, then the renewal stimulated in the 1920’s by the birth of rationalism was more profound and great, and was such as to involve most of the factories of Murano. It is to be immediately made clear, however, that not all the principles of rationalism were understood by the Muranese. They promptly assimilated the indications of an aesthetic character which led to the renouncing of every form of decorative virtuosity and to the search for 3 essential forms. They did not, instead, pledge themselves, in accordance with the dictates of rationalism, to the realisation in large quantities and of low price objects which were to be as functional as possible, because this was extraneous to the local tradition of high class craftsmanship. On the other hand the buyers, then as now, asked them for the opposite qualities: costly refinement and display of manual ability. From here we have the happy union to Art Deco, with its preciosity and decorative fancies. 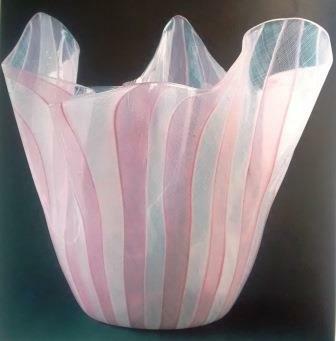 We have a statue which is essentially handicraft of production which will continue to characterize the Muranese glass-works in the 30’s and 40’s in such a way that at the dour Biennale of 1942, invaded by praise of war, the Murano glass constituted a vivacious and almost anachronistic note. The pieces which stand out are the blown and the “iridescent crossed” vases by Ercole Barovier and the coloured horizontally-banded irregular vases by Carlo Scarpa. Two glass bowls Corinth style and one glass bowl Damasco style. Designed by Ercole Barovier, 1948. Having come out from the nightmare of the dictatorship and the war, those who operated in the interior decorating sector took up activity once again with enthusiasm, nevertheless showing themselves divided between the desire to renew themselves on the bases of rationalist principles and the continuous and inevitable reference to the experiences of the 1930’s. On the one hand, in fact, faced by a modern furniture market covered almost completely by Swedish production for the whole of the 1950’s, the rationalists produced furnishing objects which were practical and simple, even programmatically modest, being able to count increasingly more in the course of time on trial production processes. Parabolic blown glass to glass tesserae. Barovier & Toso, 1957. On the other hand, the designers and industrialists who had already operated in the pre-war period tried to bend the old handicraft methods to new aesthetic solutions. And they found widespread agreement thanks to the insuppressible desire on the part of the buyers to enrich their houses, even those furnished with clearly Swedish furniture, with the rare and costly article. The rationalist instances were generally ignored in Murano, as had already happened in the 1920’s, while the attempt was made to stylistically renew the product. 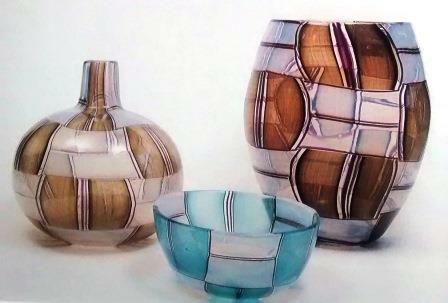 In this way the glass-makers, exploiting traditional manual techniques, shaped vases in elementary forms, often square, in bright and provocative colours, with schematic motifs, sometimes geometrical whilst others were inspired by abstract painting. Also typical of the opening years of the 1950’s were very large and asymmetrical handles which were even disproportionate in respect to the dimensions of the containers; or else uncommon holes in the body of the vases. This was an exasperated and provocative affirmation of modernity which, shortly after, would be resolved in more meditated ways. 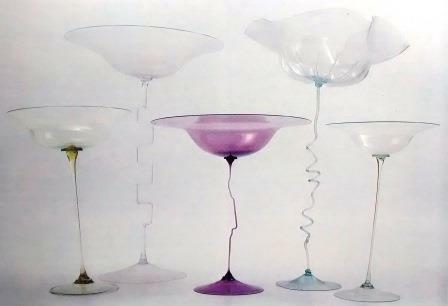 In fact, during the last decades, parallel to the affirmation of Italian design, above all in home furnishing the handicraftsmen of Murano, while they have found interesting solutions to the problem of lighting and whilst they have privileged the search for forms of balanced proportions, as also the exploiting of traditional decorative techniques in vases and table services within a modern key, are trying to avoid complaisant virtuosities.